The Town of Highlands Chamber of Commerce awarded the Highlands-Cashiers Land Trust the Robert B. Dupree Award for Outstanding Community Service. This award has been given 34 times since 1990. The award is given in honor of Robert B. Dupree to a deserving person or group for their religious, educational, or civic contributions to the town of Highlands. "100 Years of Sunrises and Sunsets at Ravenel Park"
Honoring the fact that in 2014 Highlands-Cashiers Land Trust celebrates 100 years of providing and maintaining public lands in Ravenel Park offering spectacular views from Sunset Rock overlooking the town of Highlands, and Sunrise Rock overlooking Horse cove. 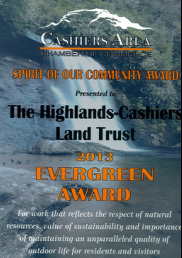 Highlands-Cashiers Land Trust Earned National Recognition by the Land Trust Accreditation Commission in 2013 in recognition of meeting national quality standards for protecting important natural places and working lands forever. At the time of accreditation, we were one of only 10% of all land trust to earned this distinguished title. 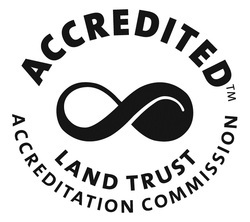 Accredited land trusts are authorized to display a seal indicating to the public that they meet national standards for excellence, uphold the public trust and ensure that conservation efforts are permanent. The seal is a mark of distinction in land conservation. Strong, well-managed land trusts provide local communities with effective champions and caretakers of their critical land resources, and safeguard the land through the generations. Cashiers Area Chamber of Commerce presented Highlands-Cashiers Land Trust with this award for the work that reflects the respect of natural resources, value of sustainability and importance of maintaining an unparalleled quality of outdoor life for residents and visitors. Honoring Highlands-Cashiers Land Trust's 100 Year of Sunsets and Sunrises Together at Ravenel Park, home to Sunrise and Sunset Rocks. In 1914 the Ravenel family donated their private lands to be a public park for all to enjoy in perpetuity. The Land Trust is honored to own and care for this beloved park. 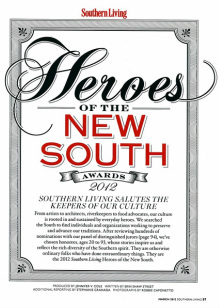 Southern Living's salute to the keepers of our Culture. Audubon North Carolina saluted Highlands-Cashiers Land Trust by appointing us as an honorary warden for exemplary service in protection of our state's most important bird habitats and sanctuaries. "First Creation would be an enjoyable read for nature and wildlife enthusiasts, and for anyone interested in the North Carolina mountains." for anyone interested in the North Carolina mountains." 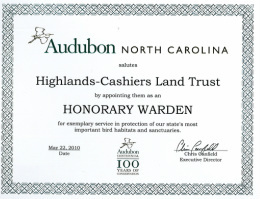 Audubon North Carolina recognized Highlands-Cashiers Land Trust for its significant conservation value to birds and their habitats. North Carolina IBA...identifying, monitoring, and conserving the state's most vital habitats for birds. 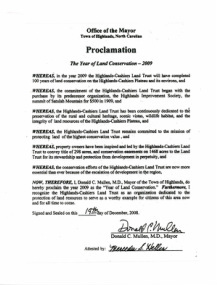 Proclaiming the Year of 2009 as "The year of Land Conservation"
Honoring the fact that in 2009 Highlands-Cashiers Land Trust completed 100 years of land conservation on the Highlands-Cashiers Plateau and its environs and acknowledging that the commitment of Highlands-Cashiers Land Trust began with the purchase of its predecessor organization, the Highlands Improvement Society, the summit of Satulah Mountain for $500 in 1909. 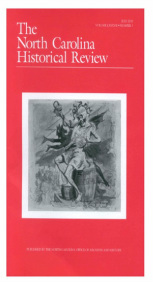 Proceeding and and debates of the 111th Congress, First Session, House of Representatives. 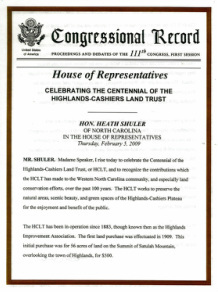 The Honorable Heath Shuler of North Carolina in the House of Representatives on Thursday, February 5, 2009 announced that Highlands-Cashiers Land Trust was celebrating their Centennial and recognized the contributions which the HCLT has made to the Western North Carolina community, especially land conservation efforts, over the past 100 years. 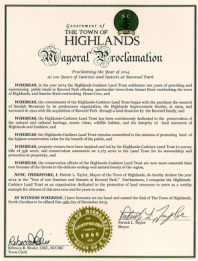 Honoring Highlands-Cashiers Land Trust's 100th Year of Land Conservation. In 1909 the citizens of Highlands came together to preserve the Summit of Satulah Mountain, the first property conserved by the organization that has evolved into Highlands-Cashiers Land Trust.